“Throat Singing” from the Siberian nation of Tuva is one of the most remarkable phenomena in all world music; individual voices are trained to produce multi-note melody-and-drone combinations. I first heard this music as an example in one of the Cantometrics training tapes, back in the 1970s, and it was a revelation. A lot of us were running around desperately trying to do overtone singing, and while a certain degree of success was inevitable (those overtones are there, of course, and can be evoked) the real power and resonance of the Tuvan masters stayed out of our grasp. Ethnomusicologist Ted Levin was the first person to bring Tuvan masters to the US. At first they were doing academic programs on the university circuit, performing for relatively small crowds fascinated by the esoteric nature of the music. Next up was the woo crowd, who had decided that the mysticism of the overtone series held clues for “sound healing” and similar New Age distractions. It was amusing to watch these overly reverential sycophants try to understand why the Tuvan musicians were loudly joking, smoking cigarettes, and punching one another with adolescent enthusiasm after the shows were over. But no matter; the music was and is amazing. There are multiple styles of “throat singing,” and different Tuvan artists specialize in one or the other. Kongar-ol Ondar is perhaps the best-known of the Tuvan masters, with a delightful stage presence. This clip offers an introduction to the primary styles of Tuvan throat singing. Meanwhile, of course, the transforming climate is making Tuva increasingly vulnerable to fires and droughts, endangering a way of life that has lasted for millennia — and a musical tradition that’s one of the planet’s great wonders. 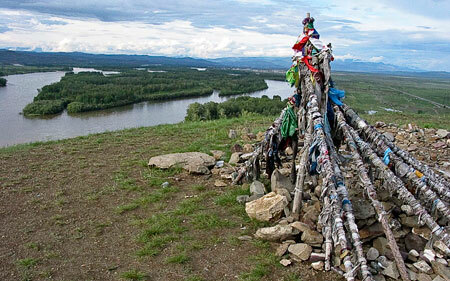 Tuva has been inhabited since the 12th century, starting with the expansion of the Mongolian empire, but because of changes in weather and climate (increasing drought, growing and fire seasons), the severity of fires and areas burnt have increased since 1990. At the same time, protecting the area against future fires is becoming more difficult. This might be because large portions of the forest are being converted to a steppe-type ecosystem after fires have occurred, which further inhibits post-fire forest regeneration. Such a conversion is precisely what models predict will be an initial indicator of climate-induced ecosystem change. In addition, annual fire carbon emissions have been estimated for the Balgazyn forest of Tuva with regard to ground fuel loading and fire severity. This is important because the dryer the fuels, the more severe the fires and the greater the greenhouse-gas emissions. And, forests are not always able to regenerate on severely burnt or repeatedly burnt regions.